I don’t know where to start really. After loosing my husband my world felt like it ended. I wanted to hold on forever, then I came across your company. It was so hard to pick up the phone and speak to you and say I have lost my husband and I would like to order a diamond and try to hold the phone call together. Then I actually called and spoke to Debra who I can only say was amazing and it did not matter I was crying and you know it was actually ten minutes before we spoke about what I wanted. For me this was so humbling and when I arranged my personal visit to collect my order, little did I know the service would continue to exceed all my expectations. I was so worried about doing the ashes and Anita very respectfully carried out this process for me. I chose my diamond and my ring and I was so excited. I was kept informed of the progress and 3 months later I took delivery. My Harry was back with me. You will never know how much your company has helped me with my grieving and the knowledge shared from your staff. 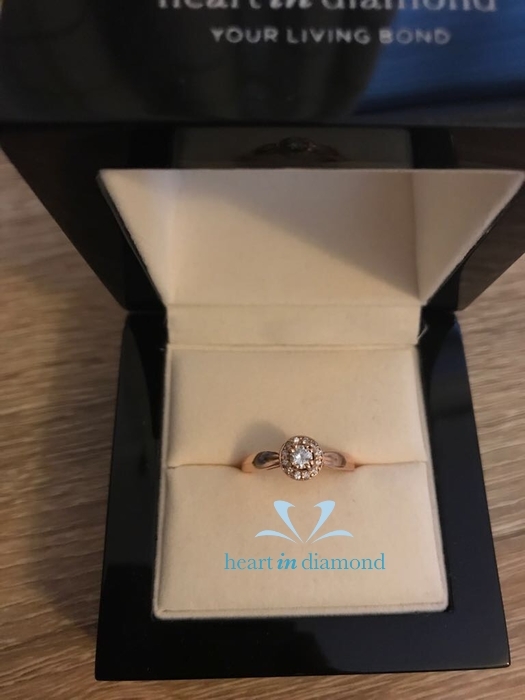 From the bottom of my heart I will be forever grateful not just for my diamond ring, my experience your staff gave me and have the strength to go forward in life. For anybody ever thinking about this process, do not ever hesitate Heart In Diamond will look after you, above and beyond what ever you expected.